Colombia Wants To Roll Back Cocaine Production By Promoting Pigs And Peppercorns : Goats and Soda The government wants farmers to uproot coca plants, whose leaves are used to make cocaine — with the promise of money, seeds and technology to help raise everything from peppercorns to pigs. A farmer picks coca leaves in a field in Colombia. At a farm co-op near the southern Colombia town of La Hormiga, a machine sorts black peppercorns. 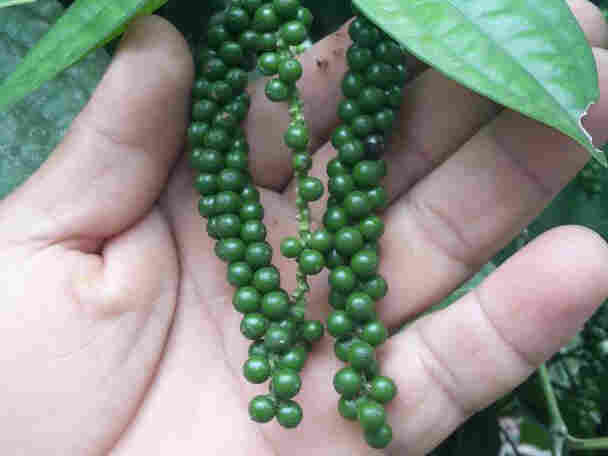 The peppercorns are grown and produced by farmers who used to grow coca bushes, the leaves of which are used to make cocaine. The farmers some of a group of about 97,000 who have switched to farming other food and livestock in the past two years — thanks to government encouragement. But switching from selling coca leaves to pepper and other food crops has been rough for local farmers: They have found few buyers for their legal products. The co-op is filled with unsold bags of pepper. Pepper farmer Pedro Culcha says his kids are giving him grief for having gotten out of the more lucrative cocaine business. "They tell me: 'Dad, when you grew coca you had money. When you stopped everything fell apart ... Now we are poor," he says. Culcha's troubles stand as a cautionary tale as Colombia tries to roll back soaring drug production. Last year, the country produced a record 422,550 acres of coca, enough to make about 1,500 tons of cocaine, according to a United Nations 2017 survey. Production has increased every year since 2012, despite efforts to curb it. A coca field in Colombia. The government's anti-drug policy involves carrots and sticks. 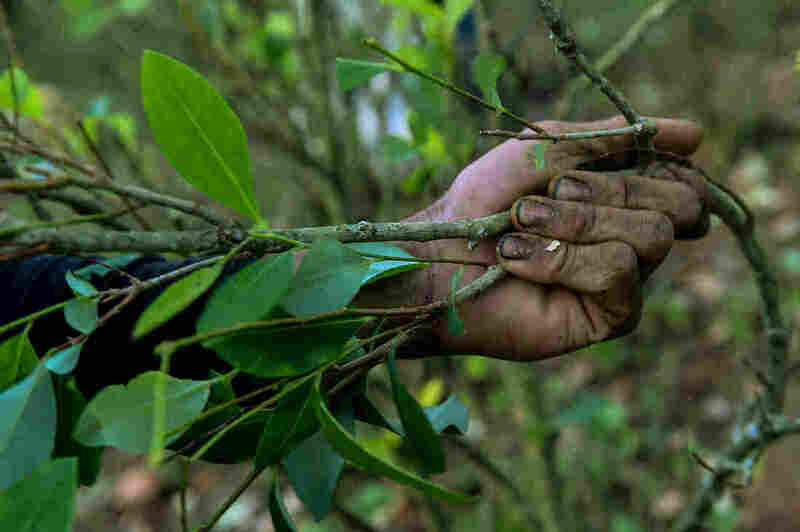 Besides sending in teams of police eradicators to uproot coca plants, the government is helping drug farmers transition to raising food and livestock. Much is riding on this strategy. In exchange for uprooting coca plants, the government has promised money, seeds and technology to help the farmers raise everything from pineapples to pigs. 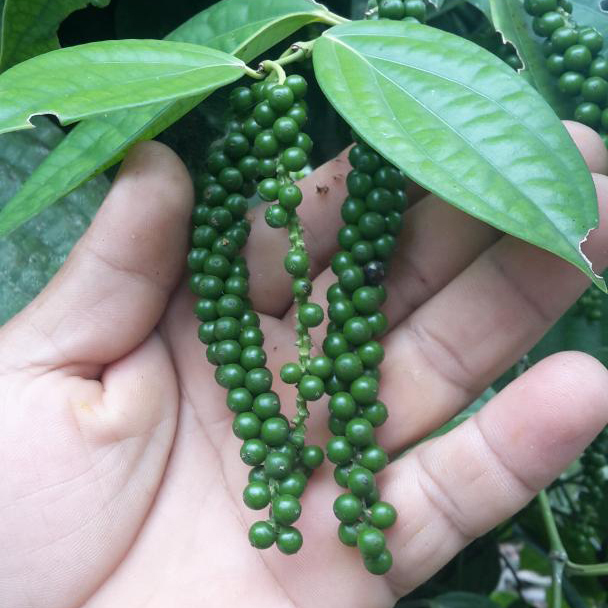 Some coca farmers are switching to peppercorns — and making less money as a result. While the budget for anti-drug efforts is tightly held, Bo Mathiason, who heads the U.N. Office on Drugs and Crime in Colombia, says that Colombia has likely spent more than any other country in the world on crop-substitution programs. In addition, the U.N., USAID and other foreign entities donate money to Colombia's anti-drug programs. 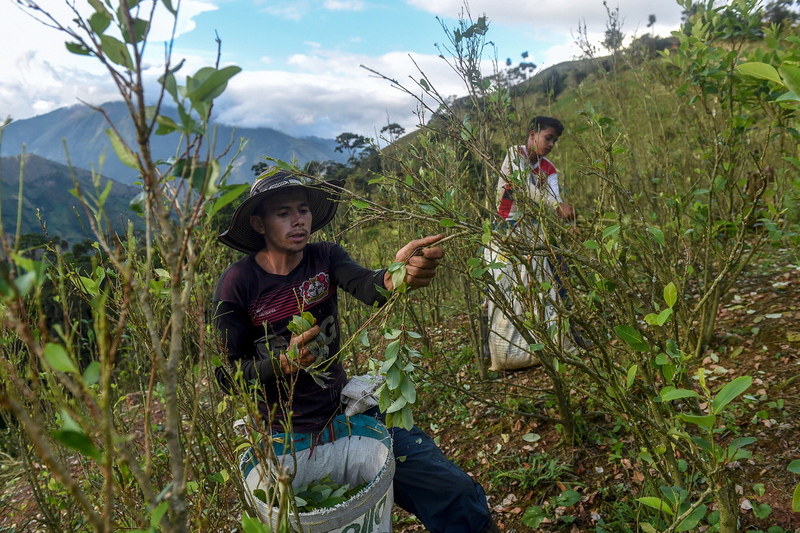 Experts point out that Colombia has been promoting so-called crop-substitution for the past two decades — and very few projects have taken hold. Many are badly designed and underfunded, says Andrés Bermudez, a Colombian journalist who runs a news website about coca farmers. "You have to now think of them as people who are going to start their own businesses in a very isolated part of the world, where they have no access to roads, where they may not have any access to science and technology, where they have no access to electricity or Internet," he says. "How are they going to do this? How can we expect them to do this?" Bo Mathiason, who heads the U.N. Office on Drugs and Crime in Colombia, says that a broader problem is that small farmers have always been overlooked no matter what they grow. "Agriculture has not really been at the top of the agenda," he says. "Colombia doesn't have a guaranteed minimum price for products and that makes farmers extremely vulnerable to commodity price changes. In the absence of subsidies and easy credit, small farmers are pretty much left on their own." Despite these hardships, Mathiason says there are other factors at play that can help persuade farmers to get out of the drug business — even if they earn less. "Where there is coca for sure there is illegal armed groups and there tends to be very high levels of violence," he says. Ángel Obando grew coca for 26 years. As threats and murders increased with the rise of the cocaine trade in and around La Hormiga in the 1990s, he had to leave his home for several years. Government eradicators destroyed several of his coca crops. He says he felt like an outlaw — and became a born-again Christian. "God transformed my life," he says. Now Obando's five-acre farm is dotted with cacao trees — the purple cacao pods hold seeds that are fermented, roasted and turned into chocolate. 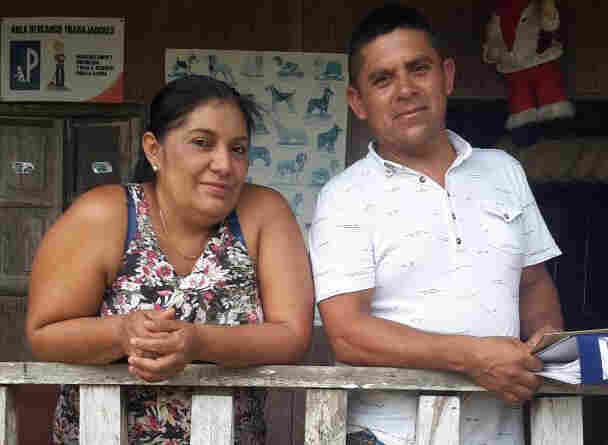 A Colombian chocolate company is buying his cacao, but Obando still earns less than he did growing coca. To make ends meet, he also raises pigs and runs a small bodega in La Hormiga. In La Hormiga and other remote parts of Colombia where production costs are higher, there's little demand for most of the items — like pepper — that ex-coca farmers are producing. Agobardo Burdos, who grows about three acres of pepper, says that when he started a few years ago he could earn almost as much as he did growing coca. But since then demand has fallen amid an influx of cheaper pepper from neighboring Ecuador — and he's now stuck with unsold bags of the stuff. "Coca meant less work and more money," Burdos says. "With pepper we are just surviving." Burdos and Culcha are both determined to stick with their new crops. But they say that only about 10 percent of local farmers are growing pepper, cacao and other food products. The rest, they say, are devoted to coca.